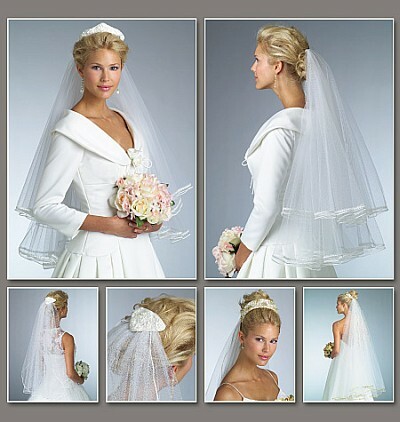 Package includes patterns and instructions for Veil A, approximately 33" long, contrast attached headpiece. Veil B, approximately 31" long, optional contrast headpiece. Veil C, approximately 46" long. 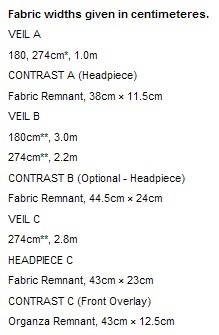 Headpiece C has contrast front. Instructions included for ribbon embroidery. Notions description...NOTIONS: Veil A: 2 yds. Each of 1/4" and 1/8" Double Faced Satin Ribbon, 1/8 yd. of 11/4" Organza Ribbon, 51/2 yds. of 1/8" Soutache Braid, 3/8 yd. of 1/8" Rat-tail Cord, Fabric Glue, Hand Quilting Thread, Invisible Thread, Iridescent Sequins, Seed Beads, Oval Seed Pearls, One 3" Comb, Embroidery Needle, First Aid Tape and Wire Cutter. Veil B: 1/8 yd. of 11/4" Organza Ribbon, 14 yds. of 1/8" Soutache Braid, 121/2 yds. of 1/4" Flexible Braid or Lace, Fabric Glue, Hand Quilting Thread and Invisible Thread. Optional Headpiece B: Tiara Frame, 3 yds. Each of 1/4" and 1/8" Double Faced Satin Ribbon, 1/8 yd. of Bridal Elastic Button Loop, Seed Beads, Oval Seed Pearls, Two 11/2" Combs, Embroidery Needle, First Aid Tape and Wire Cutter. Veil C: 1/8 yd. of 11/4" Organza Ribbon, 101/2 yds. of 1/8" Gold Novelty Trim, 3 yds. of 1/4" Organza Ribbon, 21/2 yds. of 1/8" Gold Flexible Braid, Fabric Glue, Hand Quilting Thread and Invisible Thread. Headpiece C: Tiara Frame, 21/2 yds. of 1/4" Gold Ribbon, 3 yds. of 1/16" Gold Decorative Cord, 1 yd. of 1/8" Gold Decorative Cord, 1/8 yd. of Bridal Elastic Button Loop Tape, Iridescent Sequins, Seed Beads, 2mm Gold Beads, Two 11/2" Combs, Embroidery Needle, Fabric Glue, First Aid Tape and Wire Cutter.